How to vent a floor sink when the nearest wall is ~10' away? Discussion in 'Plumbing Codes' started by Michael.L, Jun 7, 2018. GEEZ. Commercial kitchens with floor sinks have been connected to combination waste and vent systems for decades. You are making this toooo complicated. A single sink can be on a CWV system. The horizontal pipe of a CWV is unlimited in length. Doesn't the manufacture directions for the AAV override the UPC? We have a drinking fountain in CA that we were supposed to run a loop vent for and forgot/overlooked. The 1.5” drain line cannot be vented conventionally because of a window directly above it’s structural steel building posts on either side. We submitted an RFI (Request For Information) asking for an AAV to be plumbed above the flood plane with an access panel (We’ll see if the architect interprets the “Not for commercial use” in this application). 1. Weir of trap to vent wye distances? 2. Vent wye roll to 45 degree offset from waste line? 3. And trap weirs being below the centerline of vertical san-tee inlet? If you convert those strange terms into English I'll try to answer the question. Well, the most difficult thing about learning to plumb to code is plumbing drain, waste and vent to code. I just have never encountered an inspector who understood how to inspect the items above; distances before and after trap seal (weir), etc. To me, a drinking fountain is such a benign application such the there isn't enough flow to ever cause the trap to self-siphon, If there are other vented fixtures connecting to the same horizontal branch drainage piping that the DF drainage pipe connects to (and usually a UPC system is "over vented"), the chances of a positive pressure event affecting that trap will be nil. So, why do you really need the vent for that trap? Does a loop vent really do anything to abate a positive pressure event? OK, there are the purists..."gotta have a code legal vent.." So, hack the floor up to you get to a point where you can bring the dry vent pipe (a horizontal dry vent pipe below the flood level rim of the fixture) up in a wall and eventually connect it to the vent system. I don't think the UPC has a length limit for a horizontal dry vent pipe below the flood level rim of the fixture other than, "the closest place to enable turning up vertically." (Again, you UPCers correct me if I am wrong on this.) I also think that the UPC allows dry vents to be FLAT (no slope) so that shouldn't cause a long run of dry vent to eventually "rise up out of the floor." All this other stuff is - I guess you just pontificating? May I pontificate? 2012 I.P.C. You are right….I went off the rails and didn’t understand the question. In reflection, I think what your question/issue is about is whether you can have a horizontal dry vent pipe below the flood level rim of a fixture. "The vent connection is always below the overflow rim of the fixture but normally there is only a short vertical piece that is below the fixture rim: however, this is not always possible. There will sometimes be obstructions in the structure of the building that will prevent this ideal condition. Significant portions of the vent may have to be installed below the flood-level rim of the fixture. For example, there may be an installation of a floor drain where the distance exceeds the trap to weir distance. 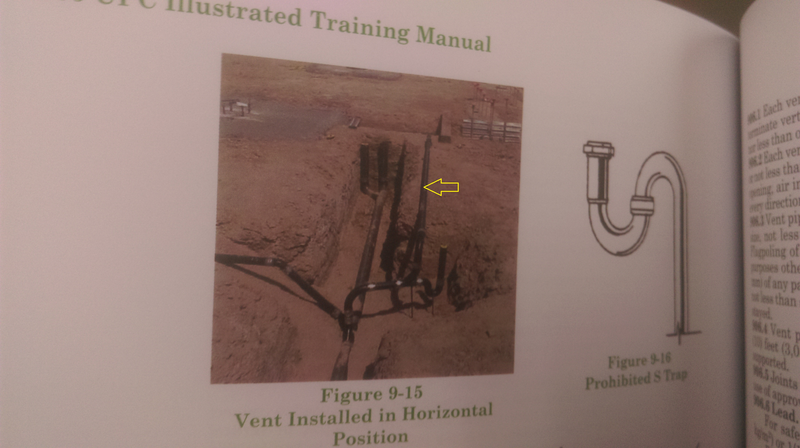 In this installation, the vent would have to be placed in a horizontal position until it could turn vertical in the wall (see Figure 9-15)"
Figure 9-15 is a photograph showing a vent running (maybe 20 feet) horizontally below the slab where there will be a floor drain. In other words, under the UPC, apparently, if it is not possible to run the vent vertically above the flood level rim of a fixture before offsetting horizontally, it is OK to run horizontally below the flood level rim. Now I don't agree with that practice and the UPC doesn't seem to agree with that practice (UPC Sections 1002.4 and 905.5), the "Unless prohibited by structural conditions...." of 905.3 seems to allow for horizontal dry vent piping below the flood-level rim of a fixture. This might help you design a solution for the venting the drinking fountain. explanation of Post # 29 ?..........Thanks ! Can anybody else put up that UPC Training Manual Figure (Figure 9-15) ? I can't do so for another week. I added the Yellow arrow to point out that this is the dry vent pipe that will obviously be below the flood level rim of the floor drain(?) in the foreground of the figure (photo).